Welcome to a world like no other. Welcome to the Edge. If he didn't get out of the city now, he was as good as dead. Cade has never met his uncle, the infamous 'descender' Nate Quarter, who years ago committed heresy by lowering himself over the cliff-face of the Edge. But Nate has returned, and the Academy of Flight are looking for revenge against all of his supporters - including Cade. So now he has to run. With no money and nowhere else to go, Cade's only option is to stow away aboard the Xanth Filatine - a mighty sky-ship bound for the city of Hive. But getting onto the ship is only the beginning of his troubles as he runs afoul of thieving goblins, brutal skymarshals, and the unpleasant-sounding threat of 'skyfiring' . 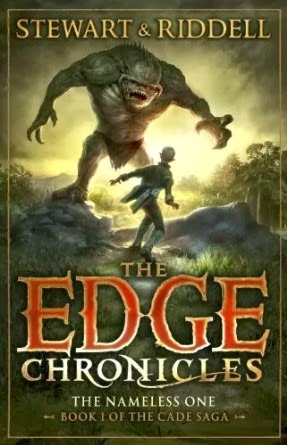 . .
Stewart and Riddell return to the world of the Edge Chronicles with the first in a brand new series of adventures starring Cade Quarter.